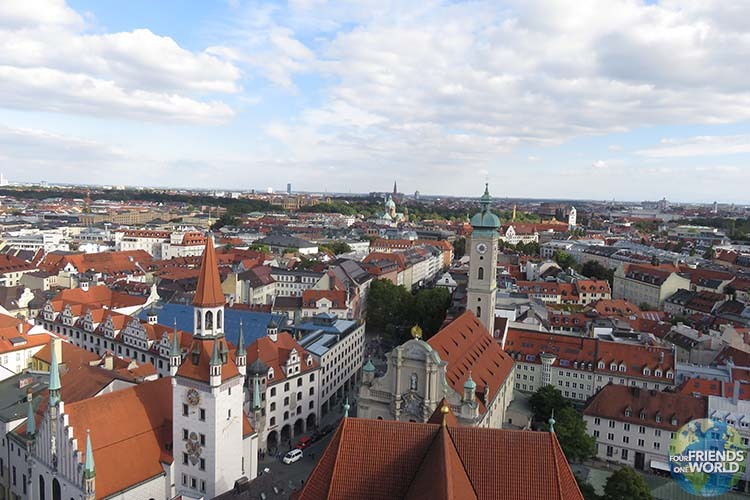 Munich or Munchen is the capital of the Bavarian state in Germany and its 3rd largest city. Known for its culture, beautiful architecture and museums, it is world renowned as the home of the annual Oktoberfest festival. A beer lovers paradise it draws visitors from around the globe. We were a group friends (a rather large group) on a mission to experience our own Bavarian adventure. We were midway through a 3-week tour of Europe. We took the early morning train departing from Berlin, with many other tourists on their way to Oktoberfest. We always encourage people to take the opportunity to travel by train, especially in Europe. While the journey takes longer, in most cases it is much cheaper. You also get a unique perspective including rural landscapes and smaller villages and suburbs. Admittedly you pass them at high speed, but it is much more scenic compared to flying over. The morning fog covered the farmer’s fields. The sun rose in spectacular fashion. We sat peacefully, gently rocking back and forth and side to side. The pulsating rhythm of the train was almost hypnotic. The train hugged the tracks winding its path through Brandenburg, Saxony and Thüringen toward Bavaria. The morning turned toward noon, in an effort to stretch our legs we made our way to the bar car where some young men were already getting into the Oktoberfest spirit. We took their lead and enjoyed a brunch beer. We don’t normally consider ourselves morning drinkers, but when in Bavaria it’s important to try and fit in. The train screeched into the station and we disembarked. Our arrival was well planned. Ambitious as it sounds, we were meeting up with 7 other friends, 5 of whom we had never met. Together we had planned 3 days of Oktoberfest shenanigans or “feiern” which is probably geographically appropriate. We were all Canadians and linked by friendships. Through months of correspondence, we planned to meet in the middle of the festival grounds later that day. To say we were all excited would be an understatement. The Oktoberfest experience had been on our bucket list for years. Our arrival to the Munich train station was not only a symbolic end to our time in Berlin but also stirred our sense of adventure and readiness for “Prost” and “auf die Freundschaft” (Cheers, Let’s celebrate our Friendship). The station was full of tourists and local merchants trying to make a Euro selling “traditional German outfits”. We pushed through the station a grabbed a cab to our hotel. Our cab ride would be one for the ages. Our driver was an 80+ year old who kept receiving phone calls from his wife. He went on to tell us “how much they hate being apart” and they call each other “all day to profess their love for each other”. In broken English, he shared his wisdom and experience with marriage. As we exited his cab he wished us a happy marriage and handed us a pad of fake euros “Here, make sure you spend too much money while you’re here” he laughed as we shut the door. What a start, we had a sneaking suspicion we would be meeting many characters like him during our time in Munchen. After a quick freshen up at the hotel, we were off to Oktoberfest to meet our friends old and new! It is the world’s largest folk festival with over 6 million people visiting it each year. Although its origins are disputed, it is believed it started as a horse race back in the early 19th century. In 1811 the decision was made to hold the event annually. In 1887 the first beer tents were established, with breweries battling to have the best decorations at the festival. It is classified as a “family friendly” event. However, you might want to get the kids home before the beer tents shut each night, or risk them learning about the messiness beer served by the litter can cause. Other than beer halls, there are dozens of traditional food stands and carnival rides galore. While beer is the main thing served, you can get non-alcoholic beverages. Some halls may also serve wine, but we didn’t see any. Show up on the day and try your luck. Most tents will have a number of free tables available each day. Be ready to show up early and make friends! Sharing a table will ensure you get in quicker. We were staying just a few train stops away from the festival site. Getting to and from Oktoberfest was really easy convenient and cheap. As soon as we exited the station, the faint sounds of music, the smell of pretzels and roasted meats drew us the right way. It was easy to follow the crowd! Our meetup point was in front of the Augustiner tent. We got there early and patiently waited. We did not have cell phone coverage and had not corresponded with our group since arriving in Germany. Nervously we stood watching as tens of thousands of people streamed by. It started to feel like we might have a hard time finding them. We settled our nerves with a quick Kransky Dog. Through the crowd, familiar faces emerged. A handful of Canucks saw us and exclaimed, “We didn’t know if we would find you!” Eventually, all 12 of us came together and we waited for our host to turn up. We were very lucky, one of our new Canadian friends had a family friend who had hosted a table in the Augustiner tent for over 20 years. He was very happy to welcome us to his premium location table, proving once again it’s who you know. We waited patiently for our host, through the crowd we saw a large German man walking towards with a large broad smile. He was decked out in the full Oktoberfest regalia. None of that cheesy tourist crap, he was the real deal. The kind of man you expect own large tracts of land. He would be accustomed to throwing a large deer or wild boar over his shoulder after a successful day of hunting. He looked like a real Bavarian huntsman. “Willkommen” he bellowed “You look thirsty, follow me.” He leads us around the back of the tent and knocked on the doors with authority. The door swung open, the staff manning it gave him a nod of respect. He turned to face us and he said what we assume was the German equivalent of “They’re with me”. They ushered us towards his table. In the middle of the hall, surrounded by 6,000 people an empty table sat waiting for us. Undoubtedly a prime location, this was going to be a special experience. Seated and eager, it took less than a minute for our waitress appeared ready to take our orders. Beers all round seemed like a good place to start. As quickly as we ordered, she was back holding 10 litres of beer (a very impressive feat of strength). “Prost” was exclaimed by all and we were officially part of Oktoberfest. The tent was huge and adorned with flowers with an elevated stage in the middle of the room holding the live band playing traditional German Oompah music. Every hour on the hour they break into Ein Prosit, a traditional Bavarian drinking song that the entire crowd sings along to. With extra enthusiastic people jumping on tables and dancing their hearts out. With beer flowing fast, it was time for food. Plates full of roasted chickens, pretzels, sausages, salted radishes. The perfect accompaniments to a copious amount of delicious beer. We drank the night away enjoying conversation with our new found friends, prosting and dancing, slowly losing our voices! We somehow made it back to our hotel safe late in the night, our heads hit the pillow to recharge for day 2. It was certain that we were going to wake up with that less than fresh feeling. With so many hangover cures available to us, we decided when in Bavaria the best cure is probably pork schnitzel sandwiches. Our heads back on the right way, we set out for a day exploring Munich. We headed to the city centre Marienplatz. We strolled around admiring the town hall with its gothic inspired structures and its squares surrounded by tall church steeples. Our next stop was the Deutsches Museum. The largest museum of science and technology in the world, with over 28,000 exhibits. We only had a few hours to spare. We knew it wouldn’t be enough. We all split up and set out exploring as much as we could. With 7 floors of science to explore it would be impossible to see it all, but an enriching experience nonetheless. You could easily spend an entire day or two in the museum and probably still not see everything. If you’re a science buff, you will be in paradise and we highly recommend taking as much time as you can spare at Deutsches. You will see more and learn more than you can imagine. On our way back to the Hotel we stopped at a local pub for a spread of schnitzels and spaetzle. If it feels like all we have done is eat, you are not far off… We were enjoying the food and a lot of it. After lunch, we retreated back to the hotel for a quick nap and refresh before meeting up at Oktoberfest that evening. Opting for a much more low key evening than the previous night, we explored the festival grounds and enjoyed some carnival rides. We are roller coasters nuts, so we had to try the most iconic coaster at the festival. Olympia Looping features 5 full circle loops in the colours of the Olympic rings. With a 52 degree drop and with speeds over 100 km. The coaster definitely exceeded our expectations! However, it is best to remember the coaster to beer ratio needs to be balanced. Next stop was the Spatenbrau tent. We sat outside to avoid the intensity of the crowds inside. After the previous night of jovial Oompah music, we thought this was the opportunity to have a conversation without yelling. We chatted and celebrated our friendship with more beer of course. This time a spread of, beef brisket and roast chicken was on the menu. Relaxed and bellies full we sat back and watch the crowds stumble by. After two intense days and a week and a half on the road, we decided on a sleep in and late morning meetup. We felt it was important to allow ourselves to recharge and refuel before our final day at Oktoberfest. We gathered in the hotel lobby, alongside a group of impressively bearded men. “What is going on here” we thought. After some research, we discovered that the group was a selection of the winners from the recent world beard and moustache competition. They had gathered in Munich to tour Oktoberfest. They had very impressive facial hair worthy of any Bavarian woodsman, they would fit right in with the crowd. We gathered and together boarded the subway train. One more daytime experience, one more stein raising work out for our arms and stomachs. Arriving at the fairground The Oktoberfest crowds were as large as the evening and the beer drinking had started early! We stopped by Hofbräu-Festzelt and grabbed some outside tables. The ordering system was the same; 1L steins of beer and lots of delicious meats and pretzels, including a Roasted Duck and Pork Belly dish. We spent the day reminiscing about our adventures up to that point and building excitement for the adventures the group would experience splitting off on our next legs. 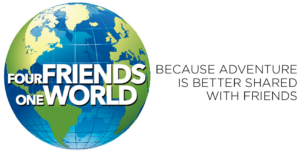 We had experienced an amazing adventure with new friends, who would remain our friends for life. Full of food and beer we decided to have one last adventure on some carnival rides. Many of the rides look pretty unsafe but when in Munich, you just have to try them! We all jumped on “Jumanji”. A walk through the “crazy house” style obstacle course. It was full of ball pits and slides, Oh yeah, you have to wear 3D effect glasses. This completely distorts your vision and with a few litres of beer in you, it makes for a pretty wild experience! There was much laughter and hijinks. If you can’t embrace your inner child at Oktoberfest, where can you? We came to the end of the ride and we gathered our group. The telltale signs of exhaustion covered us from head to toe. We had Fest’ed like we had never Fest’ed before… so much so, that we feel it is appropriate to create the verb Fest’ed. We made promises to all return together and relive the experience in the future. Some of the group were off to Paris, others were heading to Amsterdam. The Vades and another couple were renting sports cars and departing for Salzburg Austria the next morning. We embraced and said our farewell to Oktoberfest. It had been the experience we had hoped. An experience worthy of “once in a lifetime.” But in our hearts, we knew we would experience it again one day. Oktoberfest just sounds like the most fun place to be. I’ve heard so much good stuff about it, and what a great location and party to meet all your friends!! I’ve never been to the original one in Munich, but been to plenty other ones around Europe, and they are always so fun! Who doesn’t love beer and sausages? right? Havent ever attended any oktoberfest but looks like must thing to do. have heard so much about it . You have put down write up really well. thanks for sharing. So 7 friends, 5 of whom you had never met, all Canadian, linked by friendships, meeting up in Munich in the middle of the festival grounds to fulfill a bucket list desire for Oktoberfest shenanigans and frivolity — yep, that pretty much defines Oktoberfest. Love Munich. Love Berlin. Love all things German … but sadly not Oktoberfest. It feels like a drunken mosh pit so much of the time. Maybe showing my age. 😉 Glad you lived your adventure dream fully though and had a grand time. That is the point of it all. Loved the story of your cab driver … now that is a great intro to any city, and what a lesson for love. We used to attend the South African version of “Octoberfest” in my home town when I was younger and it was always a blast! But, reading your post and seeing all your pics, really makes me want to experience the real deal! I can’t believe Octoberfest actually started out as a horse race in the early 19th century – how things have changed over the years! Haha! Also good to know about booking a table months in advance online, I’d never even think of doing that! I agree, travelling via trains in Europe is so smooth! Its well worth it and even better if you get to go first class. I have never been to Octoberfest, but my partner said that if you tip the waitresses, they will make sure you get a table even if the whole tent is full. You have to keep tipping in the tent as well so they wouldn’t kick you out. 😀 It certainly does help to have connections though! And how exciting to finally meet with your friends whom you had been planning and never met! I can only imagine the excitement you must have felt. Coming from Croatia, I have visited Munich and Bavaria. I especially like the Bavarian countryside. Never been in Munich for the Oktoberfest though, but I believe it is once in a lifetime experience. The Oktoberfest is a rocking event and a great time to visit Munich. I did get a taste of the Oktoberfest when in Switzerland. Also, I loved reading about the Deutsches Museum, being a science buff, this is something I would be really interested in. The museum sounds really massive and a place to get lost in. Looks like you really made the most of your time! By the way, if I could travel by train EVERYWHERE, I totally would. That’s one of the things I love about Europe. And you are certainly right about all of those hangover cures 😉 YUM!